Word-of-mouth is priceless. Every business that wants to grow (or grow fast) needs a solid online marketing strategy and a few well-timed ads, but organic promotion will always be king. When your customers spread the word about your business, they do so to people who already know and trust them. Personal referrals feel more genuine to the listener, which means they’re more likely to lead to action than sterile, geo-targeted Facebook ads. If your clients say glowing things about your services, they’re happily and naturally endorsing your wellness business. If actual, word-of-mouth is priceless, online reviews are platinum. Meaning online approval is slightly less valuable to your business, but not by much! Recent research shows that 97% of consumers read online reviews for local businesses, and 85% trust online reviews as much as personal recommendations. And we’re not talking testimonials on your own website, we’re talking about third-party platforms where reviewers can be candid and honest. We’re talking about Google Reviews! Yes, Yelp is still a major player in the online review space … but they actively discourage business owners from requesting customer reviews. Yelp also favors reviews from active community members, so an enthusiastic review from someone brand new to the site is unlikely to float to the top. Positive reviews on Yelp will definitely help you, but they’ll have to happen organically. Google Reviews, on the other hand, are easier to control. Initially, only Google+ members could leave Google Reviews, but now anyone with a Google account can contribute. Doing so is free, easy, and Google allows business owners to nudge customers toward giving feedback. And they do so in the most streamlined, user-friendly ways possible: Google Reviews are integrated with Google Maps, so once someone has visited a business their smartphone will prompt them to rate their experience. Pretty slick, right? Google’s ranking algorithm loves reviews, so the more customers you have singing your praises, the better your local SEO will become. And since the platform is still a bit underutilized, getting in early will have an exponential impact. All this means that amassing positive Google Reviews can be incredibly beneficial to your wellness practice. Sounds fantastic, right? But how do you get started? First, add or claim your business listing on Google Maps. You want to control the information that users see when a smartphone prompt for a review pops up, so beef up your listing with descriptions, photos, contact information, anything you can readily supply. All of this information will appear in the right sidebar when users search Google for your yoga studio or wellness practice by name. Next, create a link that you can use to request customer reviews. To grab the correct link, simply search for your business on Google, click the “Write a review” button when it appears in the right sidebar, then copy and paste the URL from the search bar. (If that doesn’t work, follow these instructions.) This link can be embedded in your email signature, passed around via social media (including within your Instagram bio), added to your newsletter, or used in any way you like to encourage customer feedback. However, if you’d like some strategic tips on building a robust library of reviews for your wellness business, read on! Build a “thank you” page. Whenever anyone signs up for a package or purchases a product from your website, make sure they see a follow-up page that requests Google Reviews. They may not be ready to endorse you just yet, but you’re planting the seeds! Circle back with new customers via email. Once you’ve had your first interaction with a client in the studio or online, diplomatically remind them that you’d love a Google Review. Consider sending this reminder via email or text message so you can also offer an incentive like a discounted session in exchange for feedback. Help people write positive reviews. Even when new customers have had positive experiences, they’re often stumped when it comes to explaining exactly what went well. If you’d like to encourage positive reviews, point people in the right direction with a few questions. “What did you like about the instructors?” or “How was the level of customization?” Prompt them to think and write about your business’s strengths. Respond! Whenever you receive a Google Review, you’ll get a notification so be sure to cruise over to your business listing and reply. Responding to every review helps build community and customer trust. It also boosts your SEO, so take the time to do it, especially with negative reviews. Don’t delete them or get defensive, just respond with an idea for resolving the issue. Over time, online reviews may become the “new” word-of-mouth marketing, and Google has made it quick and painless to collect testimonials from happy customers. 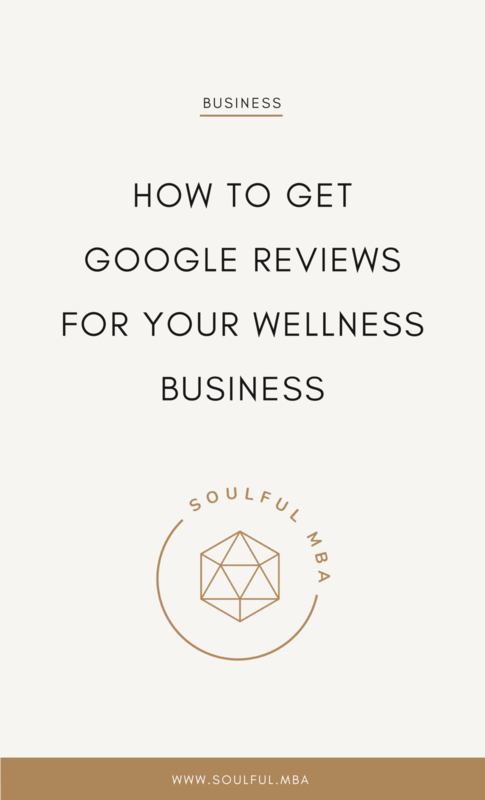 I hope we’ve convinced you that Google Reviews are a fantastic way to boost your business and promote your wellness practice. Do you have any experience with Google Reviews for your own business? Head on over to our Facebook community and share what you’ve learned and experienced!